Buckingham Palace is the official London residence of the British monarch. Located in the City of Westminster, the palace is a setting for state occasions and royal entertaining, and a major tourist attraction. It has been a rallying point for the British people at times of national rejoicing and crisis.Originally known as Buckingham House, the building which forms the core of today's palace was a large townhouse built for the Duke of Buckingham in 1703 and acquired by George III in 1761 as a private residence, known as "The Queen's House". It was enlarged over the next 75 years, principally by architects John Nash and Edward Blore, forming three wings around a central courtyard. Buckingham Palace finally became the official royal palace of the British monarch on the accession of Queen Victoria in 1837. The last major structural additions were made in the late 19th and early 20th century, including the present-day public face of Buckingham Palace. The building is occasionally still referred to as "Buck House". The London Eye, also known as the Millennium Wheel, is the tallest (its height is 135 metres (443 ft) Ferris wheel in Europe, and has become the most popular paid tourist attraction in the United Kingdom, visited by over 3 million people a year.At the time it was erected it was the tallest Ferris wheel in the world, until it was surpassed by the Star of Nanchang (160m) in May 2006, and then the Singapore Flyer (165m) on February 11, 2008. 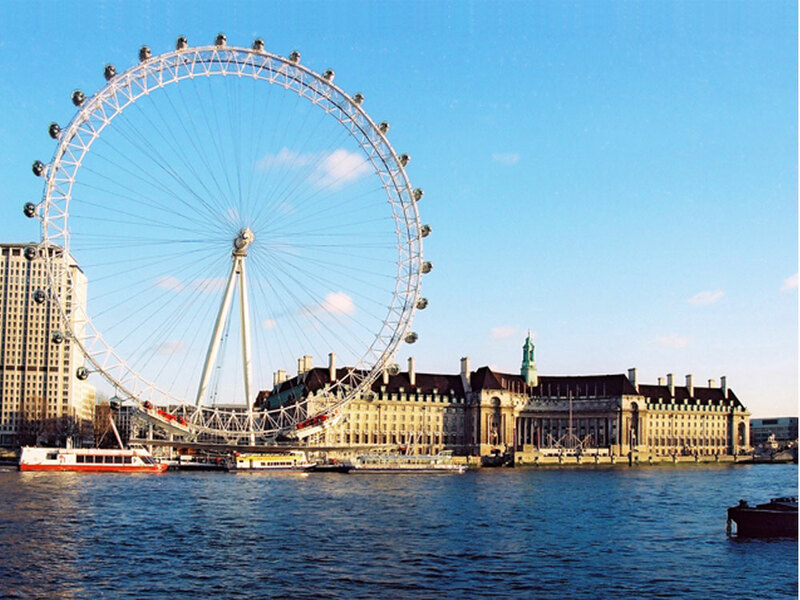 However, it is still described by its operators as "the world's tallest cantilevered observation wheel" (because the entire structure is supported by an A-frame on one side only).The London Eye is located at the western end of Jubilee Gardens, on the South Bank of the River Thames in London, United Kingdom, between Westminster Bridge and Hungerford Bridge. The site is adjacent to that of the former Dome of Discovery, which was built for the Festival of Britain in 1951.